It seems that almost everyone is into ‘tea’ these days. It’s no longer reserved for nobility or regal tastes exclusively. This delicious beverage, hot or cold, which was once associated with aristocracy and the art of living well, is now a favourite staple in every home. From delectable teas, to serving sets in fine china (see Marie Antoinette’s Gossip Guide) to tea table settings (see Tea at Trianon), tea time has been transformed from stuffy sipping to wonderful time for connecting with friends. I'm often asked if it’s possible to read this book without having read the previous two. First of all, the three volumes in the trilogy are a continuation of eachother. So, in order to appreciate the story in full, you need to read all three. Josephine's life takes such dramatic turns that it almost seems as though she lived three lives in one. Almost like three powerful novels culminating in The Last Great Dance on Earth. This one, I felt, was truly a touching and emotional read. As the first two, the third volume is also written in diary form. In this book however, Sandra Gulland, develops the memoirs even further, without ever altering them. For me, this brought Josephine to life, closer than imaginable. From the beginning of this book, Gulland lures the reader further and further in, until you become totally captivated by Josephine’s life. It was impossible not to befriend Josephine. Her letters called out to me and I often thought myself to be her priveleged confidante. Gulland skilfully captures our emotions throughout these letters. This can be seen in: Josephine’s unsuccessful and painful ordeals to have Napoleon’s baby; Bonaparte’s family’s disdain for her as well as their scheming plans to rid themselves of her; Josephine’s loneliness; Her pain and humiliation while enduring Bonaparte’s affairs; Her resilience, sacrifice and surrender for the name of love and a greater purpose…and more. I was able to feel Josephine’s emotions throughout the book. At certain points, I even became angry at her for accepting Napoleon’s affairs; but this didn’t last for long. Despite my views, somehow, I made exceptions for Josephine. I understood her reasons and also came to accept them. She understood Napoleon’s greater purpose and all that it entailed. She understood that he was a man like no other, “Je le veux”- and he conquered. Her voice, feelings and motives came through clearly throughout this historical novel. Very often, I become teary-eyed when reading about the lives of historical figures- but with Josephine, I caught myself sobbing…several times (as though I’d learned about this for the first time). 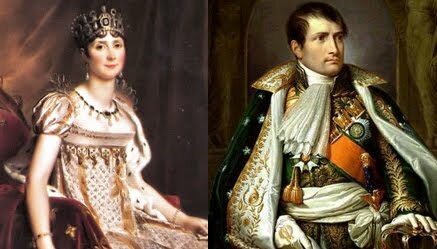 Josephine’s love, tenderness, understanding and total devotion to Napoleon, her man, came first, above all else. Besides her great love for Napoleon, Josephine’s tremendous love for her children is constant throughout the book. The detail in portraying Josephine as a caring and encouraging mother who stood by her children in their every decision, made her all the more endearing to me. The way Josephine cared for Hortense through her painful family tragedy and marital problems - Her willingness to take care of her grandchildren when Hortense needed her most- her children could always depend on her to be there. Eugene and Hortense’s letters to her are filled with caring words that reveal love and concern. There is a clear sense of their close and loving relationship in the way they all interact with eachother. They are together and united in every decision, regardless of their own personal feelings; the Divorce being a perfect example of this, as well as, their unity in accepting and welcoming Bonaparte’s decision to marry Marie Louise. These unbelievably difficult situations which must have required an enormous sense of loyalty, love and acceptance, continuously surface the story to emphasize the passionate life that Josephine lived. And in the end, Eugene’s touching letter announcing the death of his beloved mother to Bonaparte, addressed: Sire, Emperor (Papa), completely moved me to tears. I know it’s history, and I’ve read this all before; Even so, The Last Great Dance on Earth is now forever sealed within my heart. Passionate times, beautiful details, sorrowful moments, love beyond boundaries- Bringing history to life, The Last Great Dance on Earth is an exceptional book. …Not difficult to see why this is my favourite Josephine historical novel. For all those Napoleon afficionados, Bearded Lady at The Raucous Royals will be interviewing J.D. Markham, acclaimed historian and Napoleonic scholar at the end of February. ALSO...A Book Giveaway! There's an interesting twist to the draw. Check it out here. (I have strong Venetian roots…yet, I love Napoleon…Hmm…For many Venetians, this is, still today, a very divided and somewhat ‘better-left-alone’ kind of topic. When Napoleon conquered Venice and terminated the Venetian Republic once and for all, it was a glorious day for the people of the region, who had suffered much oppression; but an everlasting blow to the Venetian aristocracy. Venice, ‘Queen of the Adriatic’, would no longer be). There is a particular hotel in Venice, Palazzo Mocenigo, on Venice’s Grand Canal, which has now been converted into apartments. In it stands a 10-foot statue of Napoleon, dating from the time of the end of the Republic…I know this because I’ve been told about it repeatedly, and, have seen it myself. Interestingly, the statue is connected to the story of an aristocratic lady who once lived in the times of the Revolution, specifically in Venice. Her name was Lucia. One of her descendants, Andrea di Robilant tells her story in the book: Lucia: A Venetian Life in the Age of Napoleon. He was inspired by the statue of Napoleon standing in the Palace of one of his ancestral great-great-grandfathers, to find out more. The story revealed itself to him when he found an unopened box containing letters of correspondence written by Lucia, his great-great-great-great grandmother. The story of Lucia is not terribly exciting. She wasn’t famous or anything, but she was certainly part of the aristocracy of the times. She married at the age of 15 to Alvise Mocenigo. Through her letters you can sense the loneliness and sadness of a woman who was resigned to make the best of her marriage. Alvise is portrayed as cold and very goal-oriented, with little time for romance or love (for Lucia, that is). Lucia had wanted more. I never sensed any joy from her except that she had immense love for her family, especially for her sister. Throughout the book, her husband, who is politically affiliated to the Revolutionaries is constantly traveling and trying to make best to stay solvent; while Lucia continues to make connections with the ‘right’ people in society’s well-known circles. Even though, the book is solely based on letters and facts, (dated letters only- throughout the book), I was still very interested in the happenings of day to day life in Lucia’s world. 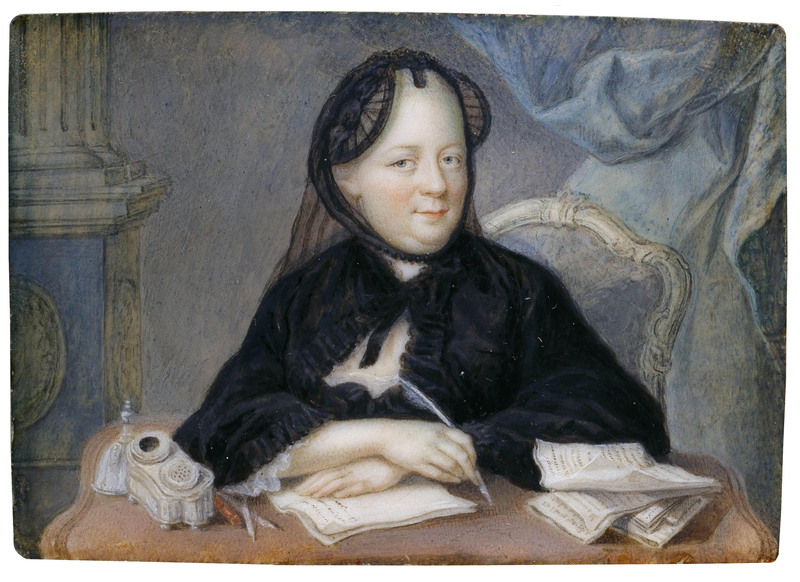 I felt her very real and was able to make a connection with this woman who struggled to keep up with the aristocracy while trying to bridge differences within the different political agendas of the time, for her husband. Despite her husband’s loyalty to his party, Lucia’s love for Venice is repeated throughout the book. She despised the fact that Venice was being overthrown- the Republic falling. For back then, Lucia was quite entrepreneurial and had a good sense of business relations. She was, as well, politically knowledgeable. After the fall of the Republic, Lucia actually befriended Josephine, and was even part of Eugene’s court as lady-in-waiting to his wife, Augusta. this is well noted in her letters. The story has a few extremely sad moments; (spoiler) involving her son. Lucia, I felt was never truly happy. She went through the motions of what was expected of her. She was true to her sister and cared for her happiness. She was a doting mother and a relentlessly dedicated wife to an undeserving and unfaithful husband. When it came to herself, though, it almost felt as though she was not entitled to happiness; this was also my feeling when Lucia finally found the love of her life. She denied her feelings and happiness all through her life. Lucia's life is not dramatic, but her days are filled with meetings, encounters and visits for influential and political reasons; all to benefit her family's security. The intricacy of her devised daily agenda itself, makes for an interesting read. I believe that writing from personal letters is extremely challenging for any author; refraining from adding personal touches is extremely difficult. Andrea de Robilant succeeds in telling Lucia’s story brilliantly and effortlessly despite this drawback. He allowed the letters to tell the story and so, Lucia’s world came to life, beautifully. Perhaps my Venetian roots and my love for Venice and the 18th century is what held my interest throughout the book. I may be partial to the time and place, but even so, I was totally immersed in Lucia’s life and felt as though she could have been one of my own great-great-great-great grand relatives. I love this book. Once privy to a select few, these treasures will be ours to discover as well. Can’t wait for this summer! In The Duchess of Devonshire’s blog, Heather writes a fun and interesting series on pooches in paintings. In an earlier post, last summer, she wrote about the famous and adorable ‘Pug’. Well, lover of animals that I am, and since the pug was also Josephine’s favourite breed of dogs- I just had to write about it as well! This cute little pooch was considered royalty as far back as 700BC. Originating in China, the pug was exclusively a member of Royal Dynasties. No one else was allowed to even own a pug! They were very prestigious, holding such high rank that they were actually paraded in front of invited guests, trotting in ahead of their masters! Ongoing debate has historians wavering as to whom exactly imported the Pug from China. Consensus now has it that the Pug was brought to Holland from China by Dutch traders in the 16th century- and they were soon a hit with the Royal families. Pugs were considered as family members, priveleged pets and sometimes offered as exceptionally precious gifts. Josephine loved pugs as well. Her beloved Fortuné was so attached to her that he just wouldn’t concede her to Bonaparte; not even on the couple’s wedding night…Story has it that Fortuné, who always slept in Josephine’s bed, refused to share this comfort, or his beloved, with Napoleon. There was a minor confrontation between pug and ‘beau’. Napoleon may have won that battle, but not without injury to his leg! 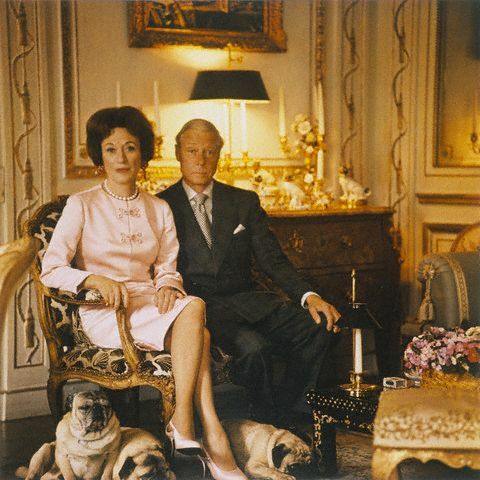 After the passing of her beloved Fortuné, Josephine always had a house full of pugs to entertain and keep her company. Even after her divorce, as she was leaving the palace forever, she was concerned about the new litter of pups just born. Reassuringly, Hortense and the servants had already gathered them all into her carriage to be brought to Malmaison with her. Josephine would have pugs around until the very end. These adorable little dogs won the hearts of many Royals. Marie Antoinette always surrounded by her devoted little companions, Madame de Pompadour, the Duke and Duchess of Windsor, and Queen Victoria (who bred her own), to name a few. Look at that face- Who could resist it? Josephine loved all that was beautiful. This included not only fine clothes, but also jewelry. After the Revolution, business for jewelers, artists, and fashion designers (couturiers), was grim. Luxuries were obviously not the first thing on everyone’s mind. Nonetheless, these people too, needed to survive; Josephine became instrumental in supporting many artists throughout this downfall. Lucky for some, she discovered their talents and for others, she became their patron. 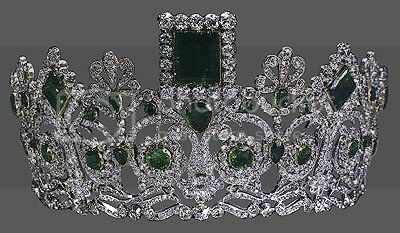 Although, the Empress was a trend setter with exquisite taste, her generosity had no limits...even when it came to precious gems. Josephine was known to give rings off her fingers to subjects, servants or even messengers, as a gesture of gratitude for a particular service rendered. Enjoy the brilliance of some of Josephine’s gems. Since my last post regarding Hillary Clinton, Angelina Jolie and Madonna's French ancestry and King's Daughters lineage , many of you have emailed me personally to find out about any good books on the fascinating story of Les filles du roi. Several books have been written on this subject, but in my opinion these are the two best ones. NOTE: I've been told by several historian friends that this book is not always easily accessible- often not available, but certainly worth the effort for history buffs! As for the Hillary, Angelina and Madonna references, please check the previous post with all sources already linked. Happy Reading and Happy Sunday! Those hand-picked French brides, selected for marriage in the New World, were more or less anonymous ladies of whom no one had really heard much about. Their business was, to put it simply, help populate the land, with no particular glory or fame attached to this. Of course, history has it that these ladies are greatly responsible for the magnitude of their contribution to the making of a new country; hence rendering them a particularly interesting topic of interest and research. Although these ladies lived their lives without notoriety, they would have probably been very surprised to know that many North Americans of today make note of this particular time in history and are proud to trace back their ancestry to the King’s Daughters. We might even know a few…for starters: Hillary Clinton, Angelina Jolie and Madonna. All of these well-known people have French ancestry descending from the King’s Daughters. Hillary, in particular, is a descendant of three of these ladies. Les filles du roi may not have known to what degree their contribution would affect history, or how far and wide their lineage did in fact, stretch; but the ongoing research for ancestral purposes proves that people are truly fascinated by Les filles du roi. Ironically, these once anonymous ladies are the source of today’s ongoing fame and popularity. Wow! 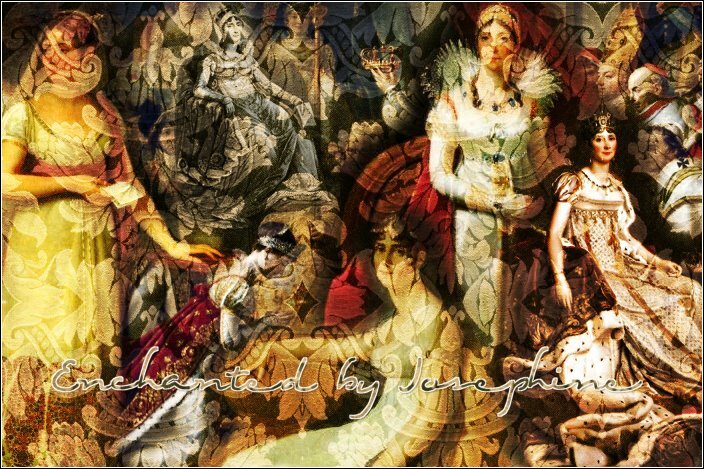 Look at what Arleigh at Historical-fiction.com made for me...Let yourself be enchanted by this beautiful Josephine collage of images. Scroll down to end of posts for full view. Wow! Look at what Arleigh at Historical-fiction.com made for me...Let yourself be enchanted by this beautiful collage of images! She's too sweet! Cinderella from World of Royalty Blog has given my blog the Great Buddy Award. I'm so happy- Thank You so much! 3. Award up to ten other blogs. 5. Leave a message for your awardees on their blogs. J-J Sandra Gulland Post + Giveaway! This interesting mix of readings about grottos and saints set me off dreaming about my childhood summers in beautiful Italy, where my grandmother, a devout Catholic recounted endless stories about the faith. One of her favorites was about St. Bernadette and the apparitions at Lourdes, in France. Each year millions of people travel to the Grotto at Lourdes to receive the miracle of healing; my granny was one of them. The Grotto is breathtaking and the holy water itself is miraculous. My grandmother has since passed away, but after so many years I still have a special blessing that she left for me; a small bottle of holy water in the shape of Our Lady of Lourdes. Thank you Lauren and Elena for reviving such peaceful memories to begin my day. 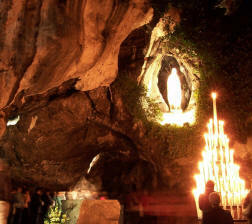 If you are interested on reading more about the miracles of Lourdes, see the writings of Rev. Monsignor Robert Hugh Benson. French Ladies in Demand - Cont'd. As posted earlier, many of the King's daughters (not Louis XIV's actual biological daughters- it's rather a literal translation which should actually read- The King's girls), came from good families and sent over to New France to help populate the land. However, many of these girls were also orphans living in convents. The Parish priest was in charge of selecting the girls that were to leave to be wed in Nouvelle France. Of course, this recommendation would come from the Sisters that were in charge of the convent. Prior to being selected, the Sisters would make sure that the girls they recommended could read and write. It was also an added bonus if the girls had also picked up the fine art of needlepoint and were adept at mending. Interestingly enough, the men they were to wed were often illiterate, although skillful in their manual trade. I’m presently doing some research on ‘The King’s Daughters- Les filles du roi’. This was an important period for Quebec and most of North America. Being a Quebecker, I’m particularly fascinated by this piece of history. Between 1663 and 1673, Louis XIV sent between 700-800 women from France to help populate ‘la nouvelle France’; Quebec. Most of these women came from good families. Though, these were not city girls, they were simple, healthy young women ready to work alongside their future husbands. These ladies came mainly from the countryside and were already presumably accustomed to working the land and tending to manual type work. It was important at this time to cultivate, as well as, populate the new land. Louis XIV paid for the ladies’ recruitment, clothing and travel. He also sent them off with50 livres for their all-around necessities (accessories, needles, scissors, shoelaces…). The ladies were presented to mainly fur traders, officers and farmers to be chosen and then wed if met with consent by the former; the ladies had the choice to refuse the suitor. Once the couple agreed to be married, the ceremony took place a month later. The king then started the new couple off with some livestock and an additional pay. The king also gave the couple with 10 children a yearly pension as an incentive and additional stipend for those with 12 children or more. These young women from France were instrumental in populating New France. They are part of the ancestry of most of today’s French North Americans. More on this at a later date. Here in Canada’s bitter cold winter, there’s no way I’d even dream of leaving home without a pair of warm gloves. I’m sure that in the 1800’s, keeping one’s hands warm may also have been a consideration, but more importantly, these were an important part of a person’s formal wardrobe. Thanks to Josephine and Napoleon, gloves were all the rave in the 1800’s. ‘The Emperor had over 200 pairs and Josephine also started a trend. It was said that she thought her hands were not her best feature and so she covered these gracefully with gloves. Also the style of dresses in the 1800’s was short puffed sleeves, so it was fashionable to wear long gloves to cover the skin for modesty. Gloves were such an important part of the wardrobe that these were worn as much during the day (even indoors) as they were in the evening. It was considered very improper to put on or take off gloves in public’. Bigelow, Marybelle S. Fashion in History: Western Dress, Prehistoric to Present. Minneapolis, MN: Burgess Publishing, 1970. Yarwood, Doreen. Fashion in the Western World: 1500–1900. New York: Drama Book Publishers, 1992. Except for fall and winter gloves, I hardly ever see anyone wearing gloves as formal accessories…well, maybe sometimes at a gala or at a very ritzy event. I wonder if we’ve replaced these with fancier manicures instead? Hmm… the glove look is actually very sophisticated and elegant; yet fashion slowly dictated against them.